Easily accessed directly from the TGV station, this comfortable and professional serviced office centre enjoys an extremely convenient location and offers effective workspace solutions for mobile entrepreneurs and freelancers on the move. It stands in the dynamic Novaxis business district in which scores of companies employ thousands of people. There is a direct train from the station to Paris International airports. 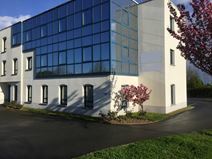 This impressive centre is situated in a vibrant area within the Le Mans University Park and provides a range of private offices and co-working spaces that are available on flexible terms. The flexibility of this office-space is suited to any individual business needs and requirements. On-site meeting rooms, conferencing rooms and secure parking are all available at this prestigious address. The centre is well located in terms of transport, with tram stops nearby and easy access to motorway and ring road. Local amenities can be enjoyed outside of the office in the immediate vicinity as well.